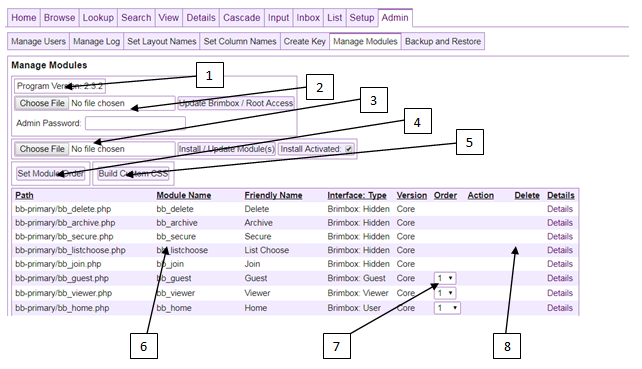 The Manage Modules module is for adding modules to Brimbox and also used to update Brimbox. At the top is a file selector and the Update Brimbox button which is used for updating the Brimbox standard program from the Brimbox_Update zip files provided at the Brimbox website in Downloads. This will update and overwrite all the standard Brimbox modules without overwriting the configuation files in the bb-config directory. Below it is a file input, checkbox, and the Install Module button for installing and updating modules. This will install a prepared and valid module from a zip file; check the Update Module checkbox to update a module rather than installing anew. Once the module is installed it appears in the module list below; it will also need to be activated before it appears in the tabs or as a button along the left side of the admin or setup tabs. Below the Install module file input is a button called Set Module Order. This is for reordering modules should that be desired. The Manage Modules module is only available to administrators and can be selected from the Manage Modules button on the left of the Admin tab. The Brimbox program version information is listed here. This area is for root access and updating the Brimbox program. After consulting the release notes, update Brimbox with the appropriate zip file. Themes and other major builds may also be uploaded here. The zip file structure will correspond to the path from root upon upload. This area is for installing and updating Brimbox modules. The zip file must be a valid module with a proper header containing a module with a unique filename. Modules install here will be placed in the bb-modules folder. The “Set Module Order” button submit the order of the modules according to the value set in the list displaying the modules. The “Build Custom CSS” builds bb_box.css and bb_styles.css from bb_box.less and bb_styles.less substituting in variables from the bb_less.less configuration file. The module information is displayed here. The module order is set in these dropdowns. The order chosen must be strictly ascending from 1. Note hidden modules will have an order of 0. In the module list there are links for taking actions on the modules. If the module is not activated, there will be links to Activate, Delete or see the Details of a module. Activate will activate the module, the module will not appear in the tabs or buttons while deactivated. The Delete button will delete the module from the list and the primary module file, and the Details link will provide extra details about the module from the module header. If the module is active, a Deactivate link will appear (along with the Details link) so the module can be deactivated.